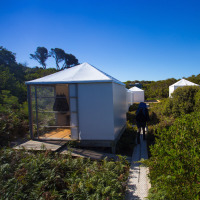 The Bay of Fires lodge walk is a 4 day / 3 night experience offering small groups of no more than 10 walkers the opportunity to explore this fascinating beach environment and diverse woodlands nearby. 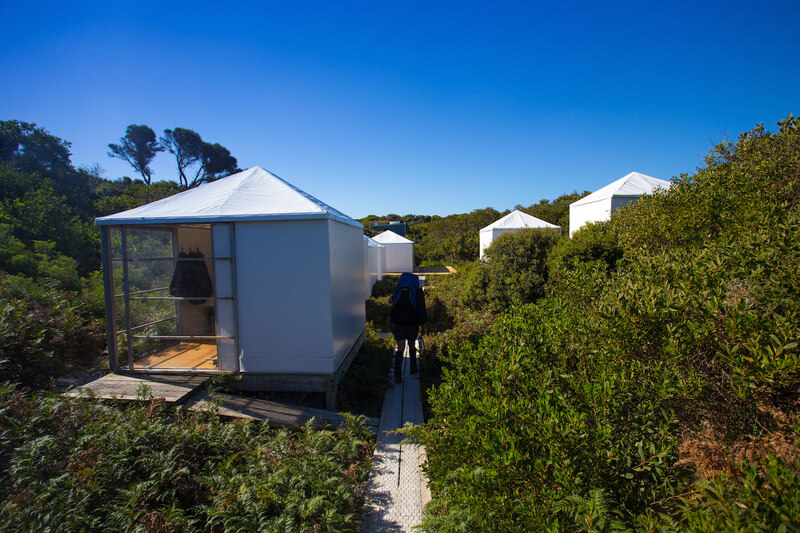 The first night is spent at Forester Beach Camp, which has been designed as a demountable seasonal structure. 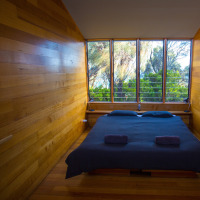 Your second and third nights are at the multi-award winning Bay of Fires Lodge. 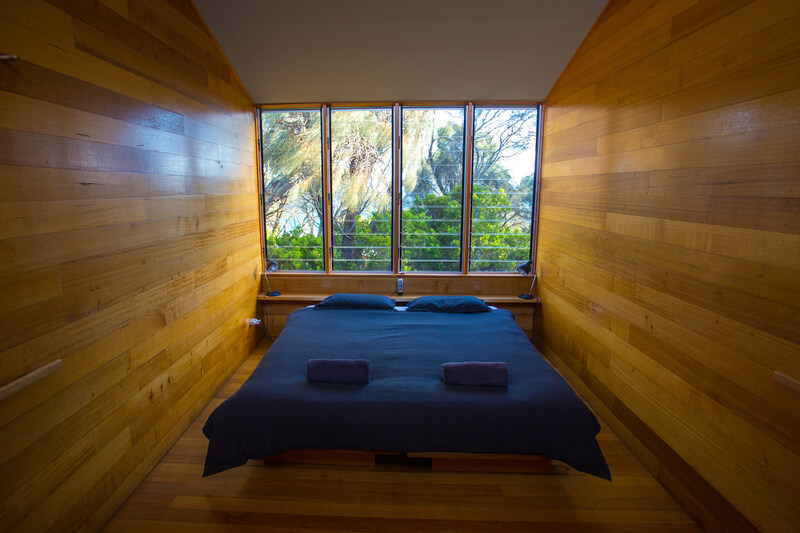 There is plenty of time at leisure here to enjoy this stunning architectural and sustainably-built lodge. Here you may choose from activities such as kayaking, fishing and snorkelling, or reward yourself with a treatment at the Lodge Spa, surrounded by nature. Or simply relax and soak up the stunning scenery! 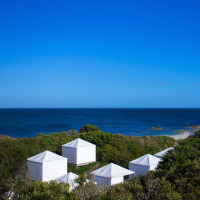 Forester Beach Camp, where our first night is spent, is nestled in a protected sand dune swale behind a glorious white sand beach. 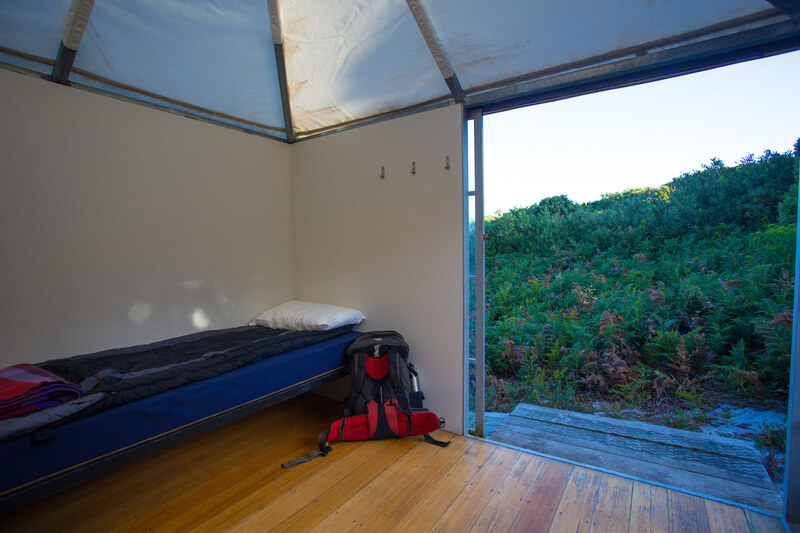 This environmentally sustainable, demountable seasonal camp offers comfortable twin share rooms with timber floors and canvas roofs, private wash areas and composting toilets. Meals are enjoyed on the outdoor decks or as a picnic on the beach. 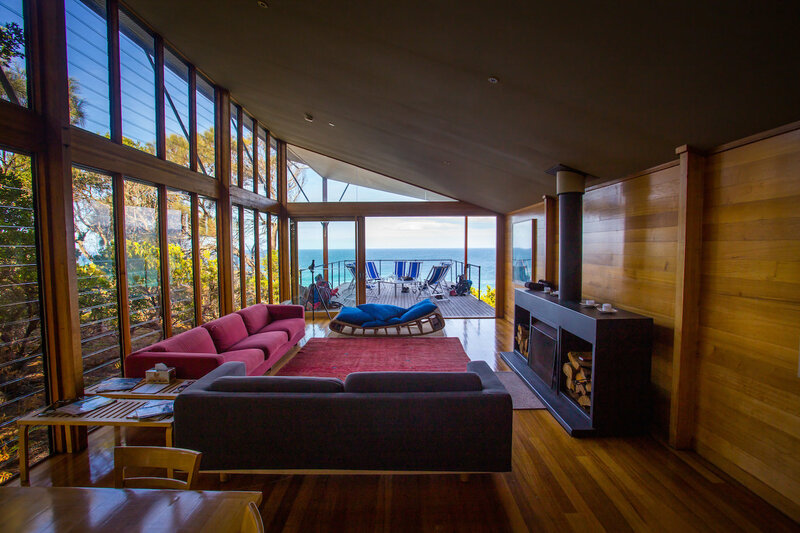 The award winning Bay of Fires Lodge is set on a hilltop, 40 metres above the sea, and surrounded by National Park. This ecologically aware building has been designed to blend in to and connect with the landscape. Here you will experience true communion with nature in accommodation that combines simplicity of design with comfort and warmth. In the magnificent living area with its large timber deck and open fire, you'll enjoy delicious meals prepared with the freshest local produce, accompanied by fine Tasmanian wines. Solar power provides the lighting, while hot showers and comfortable hotel beds add a touch of luxury at the end of each day's activities. There is also a small library which is comfortable and cosy looking out over the ocean. Meet your tour guides and fellow guests at Quamby Estate in Hagley at 8.15am (please let us know if you would like us to arrange your pre tour accommodation at Quamby Estate). Alternatively, you may be collected at The Sebel in Launceston at 7.50am. Guides will complete a gear check before we depart on the scenic journey to the northern part of Mt William National Park. 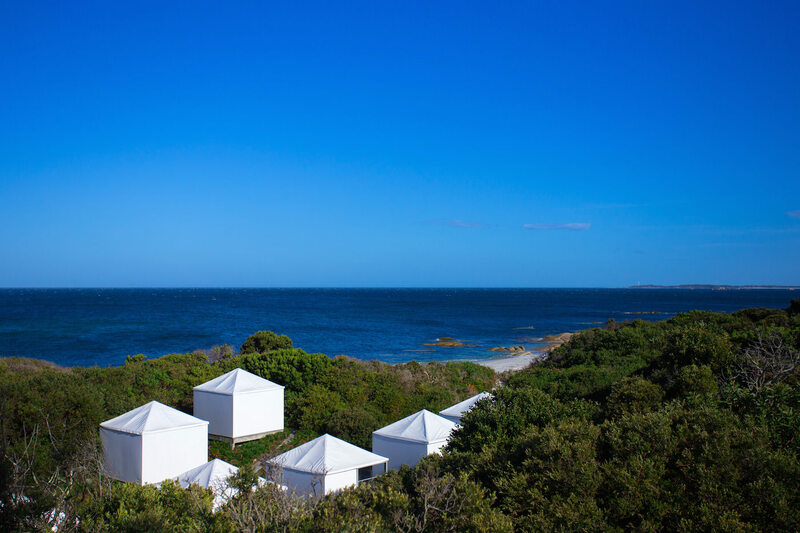 Begin walking at Boulder Point with views of the Bass Strait Islands. Enjoy lunch on one of the many pristine beaches. 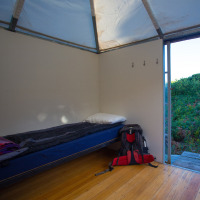 The evening is spent at Forester Beach Camp in twin-share, semi-permanent tents. Meals are usually spent relaxing on the deck and enjoying the surrounds of the dune swale location. Following a relaxed breakfast we begin walking south, along ridge lines of sand dunes and marsupial lawns. Enjoy lunch at one of the sheltered coves behind the sand dunes near Eddystone Point Lighthouse. 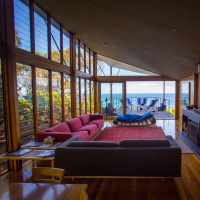 Continue along the secluded beaches leading to the Bay of Fires Lodge, in time for afternoon tea. The remainder of the afternoon is at leisure. Perhaps you might like to reward yourself with a spa treatment at the Lodge Spa (best to pre-book to avoid disappointment). The evening is spent relaxing at the majestic lodge. 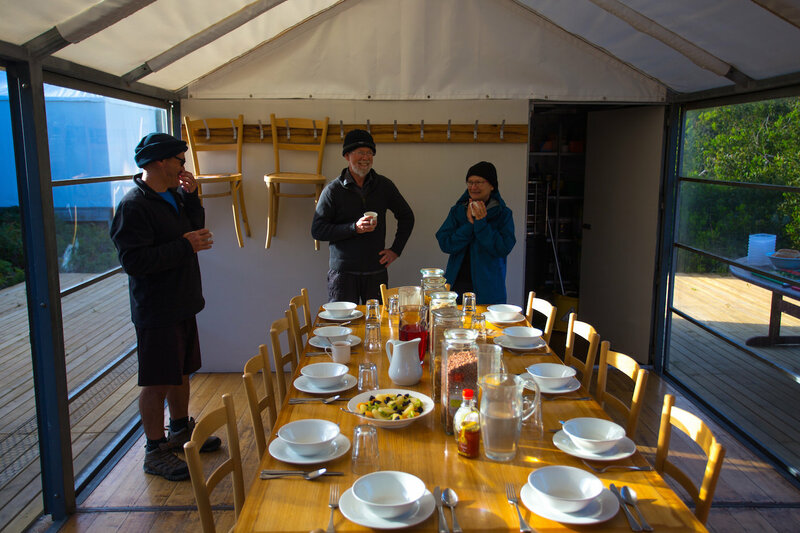 Meals are prepared by your lodge hosts and guides and accompanied by fine Tasmanian wine and beer. Based at the lodge, the day is yours to decide how you would like to enjoy the area. 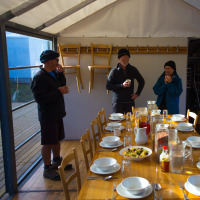 Enjoy a hot-cooked breakfast and freshly brewed coffee before kayaking down the Ansons River and across Ansons Bay. Or perhaps you would prefer to try a spot of fishing, snorkelling in the marine nursery, or just relaxing and soaking in this stunning setting. Of course there is always the opportunity to pamper yourself at the award winning spa! In the evening you may like to go for a walk to try and spot wombats, wallabies, Forester kangaroos, possums or even a Tasmanian devil. Following a leisurely breakfast at the lodge, there is time for a morning walk or swim, before we depart the lodge, walking through eucalypt forests and coastal heath land. After lunch, the return journey takes us through the picturesque Pipers Brook wine region stopping at Dr Andrew Pirie's vineyard. Continue on to Launceston, arriving at the Sebel Hotel at 5.30pm, Launceston Airport at 6pm and Quamby Homestead at approximately 6.30pm (please let us know if you would like us to arrange your post tour accommodation at Quamby Homestead). A moderate level of health and fitness is required as you will be covering distances of up to 14km (approx. 7 hours) and you will be required to carry your own pack. Usually packs weigh between 8.5kg and 9.5kg but can weigh as little as 7.5kg.